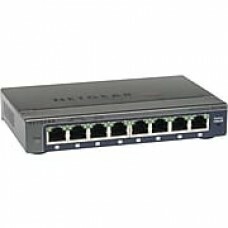 The NETGEAR ProSAFE GS108E 8-Port Gigabit Ethernet Unmanaged Plus Switch offers a 10/100/1000 Mbps connection with eight ports and green features for energy savings. With eight Gigabit ports, the NETGEAR ProSAFE GS108E 8-Port Gigabit Ethernet Unmanaged Plus Switch gives you greater control and flexibility when managing your home or office network. The switch offers traffic prioritization and monitoring, VLAN support , IGMP snooping, rate limiting, and easy troubleshooting. Plug-and-play installation makes it easy to get the device up and running, while green features help you save energy. With eight auto-sensing ports, the GS108E seamlessly accommodates both Fast Ethernet and Gigabit devices on the same network. It is able to detect different types of network traffic and prioritize between various tasks, such as voice and video. This helps improve the delivery quality of applications such as VoIP, multimedia broadcasting, and video conferencing. Simply plug in your new NETGEAR unmanaged switch, and it is ready to go, with no software or configuration required. In just a matter of minutes, you are able to build multiple network groups effortlessly. The NETGEAR ProSAFE 8-port Gigabit Ethernet Switch offers energy-saving features to reduce power consumption. A fanless design means the switch runs quietly, so it won't disturb you while you're working. The NETGEAR ProSAFE GS108E 8-Port Unmanaged Plus Switch come with a cable diagnostic option that enables users to easily find out the health status of their network cables. If there are any problems, this feature helps quickly locate the point where the cabling fails, allowing connectivity issues to be fixed much faster. The NETGEAR ProSAFE 8-port Unmanaged Plus Switch includes advanced networking features for managers, including VLAN, IGMP snooping, link aggregation, rate limiting, and traffic monitoring. NETGEAR ProSAFE Gigabit Plus Switch, power adapter, rack-mounting kit, Quick Install Guide, and Resource CD with PC Utility software.